The Play Harder Tours “BeerQuest 2018 Munich to Prague” trip is just a few months away. Dates are set, air and accommodations have been booked, all that’s left is a bit of fine tuning. Within 2 months of our trip we will book tours with local guides, buy train tickets and make reservations for special things we might want to do. The trip runs 16 days including our 2 departure days. We bookended the trip with 5 nights in both Munich and Prague, sandwiched in between are 2 nights each in Hallstatt Austria and Cesky Krumlov. Beer centric travelers will love this trip with both Munich and Prague being 5 star beer centric travel destinations, and Hallstatt and Cesky Krumlov both UNESCO World Heritage sites. The third leg of our adventure starts with a noon pickup from the Hallstatt Lahn Bus Station just south of the village. Our transportation is provided by the CK Shuttle, offering both shared shuttle bus transportation and private transfers. The vehicles are comfortable, non smoking, fully air conditioned with an English speaking driver. The shared shuttle cost is 950CZK or about $46 per person with the travel time to our destination of Cesky Krumlov in just under 3 hours. CK Shuttle offers transfer service throughout the Czech Republic, to Munich, Budapest, in addition to many destinations in Austria. Our destination of Cesky Krumlov is in the South Bohemia region of the Czech Republic. The Vltava River splits the city in two with the north bank dominated by a 13th-century castle. The castle sits perched high above overlooking it’s subjects, it’s round bell tower acting as a sentinel with a panoramic view of the surrounding area. Below the tower, the Latran area, with it’s maze-like alleyways, was originally home to servants quarters for the castle and the towns wealthy aristocrats. On the south bank of the Vltava is the old town area with it’s city hall, town square, affluent housing and organized streets. Today many of the large homes are now hotels. Cesky Krumlov is a fairytale medieval town forgotten by father time. This is a town that thankfully never experienced the industrial revolution and still keeps its medieval character. 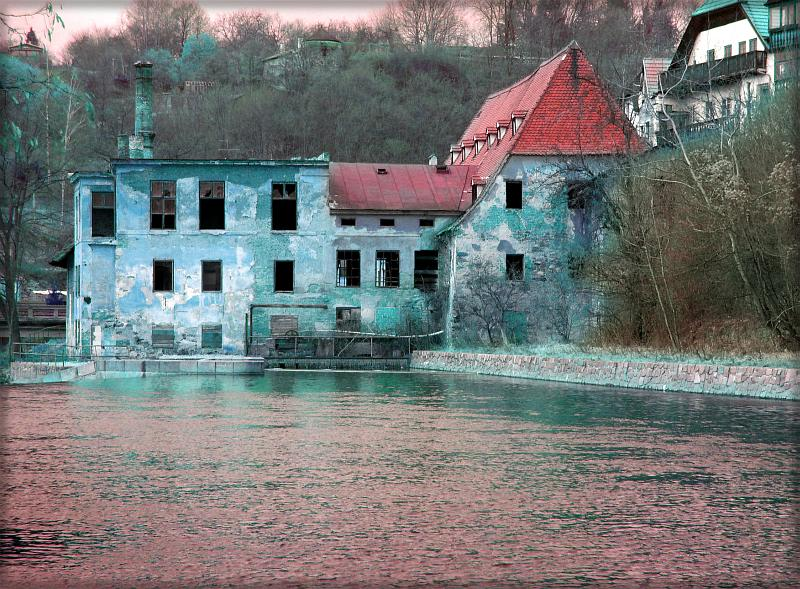 Following World War II, while under communist control the town fell into disrepair lasting till the fall of communism. 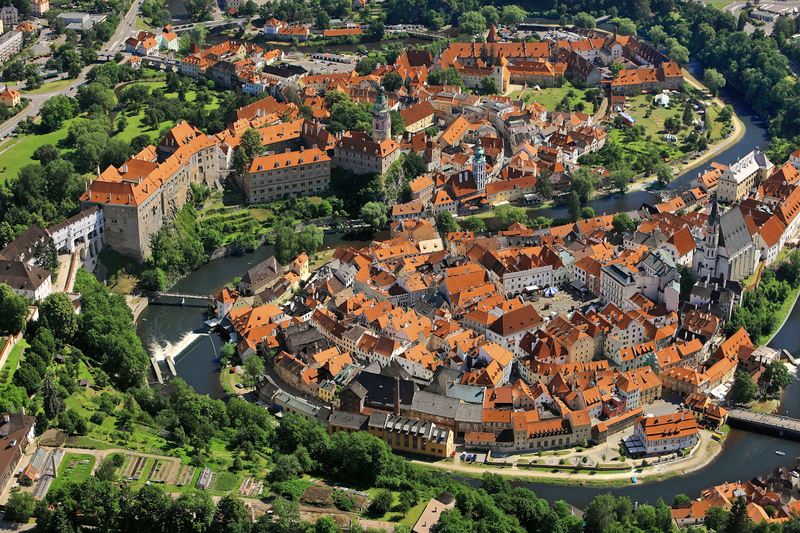 In 1992 UNESCO added the historic center of Cesky Krumlov to their World Heritage list thereby ending years of neglect. 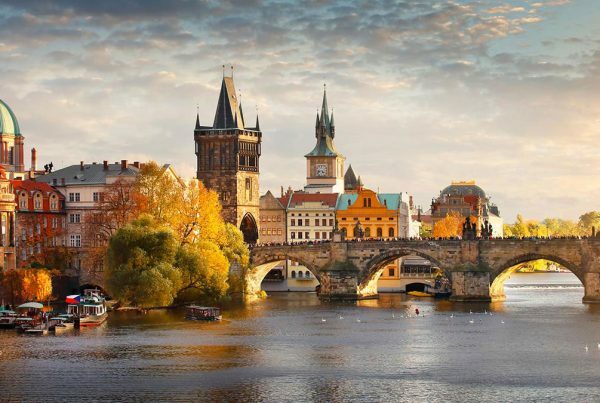 The past 25 years has seen a magnificent restoration of this beautiful city, with the help of UNESCO, the European Union, the Czech government and the home owners themselves with an investment of 187 million dollars. Today, much of the town has been restored to it’s former beauty making it one of the top tourist destinations in the Czech Republic. The popularity of the centuries old medieval Czech town is easy to understand with 300 restored historic structures and the 2nd largest castle complex in the Czech Republic next to Prague Castle. The town is inhabited by 14,000 full time residents and visited by close to 1 million tourists annually. This popularity is a double edge sword however, as daytripping tourists invade the town daily between 11:00am to 4:00pm. Just like Venice Italy, you must stay overnight to truly appreciate it. Staying over one night is good, but two nights is better as you maximize your time in the mornings, late afternoons and evenings avoiding the flood of tourists. Before getting to where to stay and what to do in this beautiful town, please know that the Czech Republic offers great value to American and Western European tourists. Beer is actually cheaper than water and can be found in many spots under $2 for a half liter. A delicious traditional Czech diner can be had for under $10 per person. Hotel rates in a luxury 5 Star hotel are usually under $150 per night, and AirBnB rentals in prime locations for $100 per night. With that in mind consider Hotel Ruze (Hotel Rose), a 5 Star hotel that was one of the oldest and best preserved estates in Cesky Krumlov. Hotel Dvorak, a 4 Star hotel on the bank of the Vltava River with it’s magnificent view of the Castle of Cesky Kromlov. Many CK hotels will include breakfast in the cost of the room. In our case, we decided to stay in an AirBnB apartment in the Latran area just off of Latran Street and it’s many restaurants and pubs. The apartment complex is called Orangerie, and offers many uniquely arranged units and provides a terrace and garden. Our unit, Orangerie Pomelo is an independent house right in the old brewery garden offering a quiet place to relax with it’s spacious living area that includes a big kitchen, living room and king sized bed. It’s obvious that the town itself is the draw to Cesky Krumlov, find the best way possible to immerse yourself in the town and it’s culture. The Cesky Krumlov Castle complex with it’s bell tower, Baroque Theater, 27 acre castle gardens is the main attraction, but there is much more to see. Wander the labyrinth of narrow cobbled streets and make your own discoveries. I hired a highly regarded private guide, Eszter Sarody (ceskykrumlovguide@gmail.com) to lead a 3 hour walking tour to efficiently navigate the entangled maze of small roads and alleyways. Don’t worry about getting lost, that’s part of the fun! Following our walking tour we should be ready to explore on our own. The exterior areas of the castle and gardens can be explored for free, but the castle interior is by guided tour only ($7 per person). You can climb the 162 steps to the top of the bell tower ($4 per person) for a spectacular view of the town and surrounding areas. 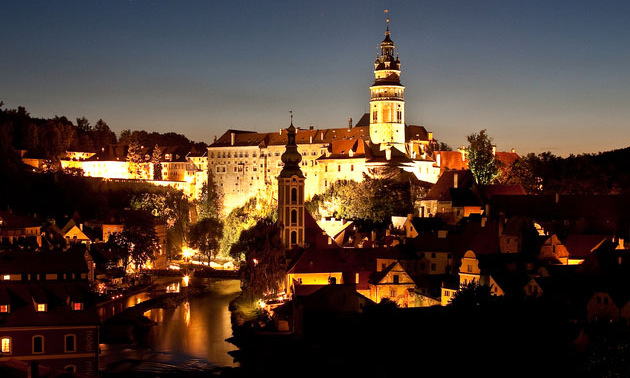 Perhaps you could be interested in the mysterious side of Cesky Krumlov? Learn authentic tales and legends with Wiseman Free Tour on their evening ghost tour. Your local guide will lead you down dimly lit cobbled streets to places where Cesky Krumlov ghosts are still seen and learn the legends behind them. The medieval theme carries over to many of the towns dining options, but not to the extent of the very touristy Medieval Times we find in the US. You’ll see wait staff dressed in peasant garb, cooks preparing meals over open fires in buildings that once served an important role for this historical medieval community. Most serve traditional Czech cuisine although other dining options, including vegetarian cuisine is often available. Krcma v Satlavske, is my favorite and reservations are recommended. Located in the dungeons of the old town prison, you are surrounded by stone walls decorated with axes, swords, and armour as you sit at heavy wooden tables. The restaurant is dimly lit, relying on candles and the open grill fire which is used to prepare various grilled meats providing an amazing ambiance to the space. U Dwau Maryi (The Two Marys) sits on the south bank of the Vltava, down a narrow cobblestone street, in a 500 year old building serving authentic Bohemian cuisine. Seating is scattered throughout the property, but on a day with great weather ask to be seated at the riverbank. The restaurant is known for their “Old Bohemian Feast” a platter that includes a sampling of all of their main dishes. As an alternative to the meat heavy old style Czech cuisine The Two Marys also offers an extensive vegetarian menu. Papa’s Living Restaurant, in the Latran area, offers a change of pace menu focused on international and Italian cuisine, pasta and pizza are their specialty. 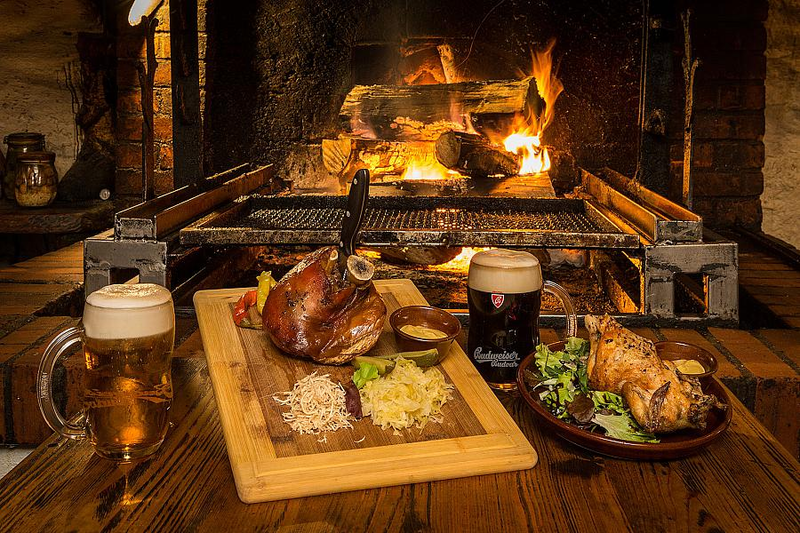 The Eggenberg Pivovar Restaurant, located on the north side of the Latran area (Pivovarska 27), The Historic Brewery Czech Krumlov and Pivovar Restaurant are all one in the same. Pivovar is the Czech word for brewery, and beer has been a cornerstone of this town since the 1500’s. Unfortunately tours of this old world brewery have been suspended during renovations but the restaurant is still open. 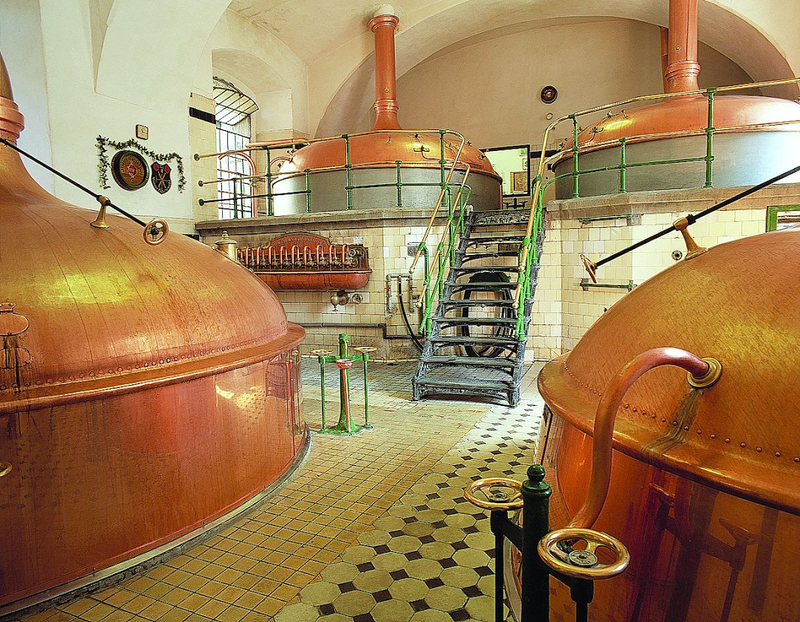 With luck, parts of the old brewery will be preserved as a reminder of the brewing traditions of South Bohemia. Cikanska Jizba, known locally as the Gypsy Bar, is located on the south bank of the Vltava just 100 meters from the Barber’s Bridge featuring traditional Czech and Romani cuisine. If you are fortunate enough to plan your Cesky Krumlov stay over a weekend you’ll be in luck as this is the place for live Romani music! The Beer-Centric Traveler writes for Play Harder Tours… Please email Bill@playhardertours.com and start your travel planning today! For a complete list of recommendations please email with “Cesky Krumlov” on the subject line. I’d love to hear your suggestions too.